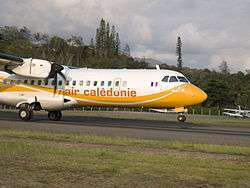 This article is about Air Calédonie, the domestic airline of New Caledonia. For Air Calédonie International, see Aircalin. For the defunct California airline with the same name as the callsign, see AirCal. An Air Calédonie aircraft landing at Nouméa Magenta Airport in New Caledonia. On 9 December 1954, a group of aviation enthusiasts created the first Caledonian airline - the Caledonian air transport company: Transpac. The aim was to create an airline service between Nouméa, the mainland and the islands. The company's first aircraft landed on 9 August 1955 at La Tontouta. The twin-engine, fabric-covered aircraft was a De Havilland Dragon "Rapide" DH 89 and could carry 8 passengers. The Dragon "Rapide's" inaugural flight took place on 28 September 1955 to Maré and Lifou from Magenta. The service to the Isle of Pines and Ouvéa began in October 1955. In February 1958, Transpac purchased the De Havilland Héron DH 114; a 17-seater aircraft. The aim was to meet the needs of increasing local traffic. The company bought three of these aircraft in succession with the strategy of developing a regional network, especially to the New Hebrides. The increase in traffic led to fleet renewal as of 1968. The company chose twin turboprops as these aircraft were larger and more modern and reliable. In 1968, the Twin Otter was the first turbine-powered aircraft to arrive in Air Calédonie's fleet. It was a 19-seater and was equipped with more reliable technology and was more powerful than piston-powered aircraft. 9-seater Britten Normal Islanders were added to the growing fleet. By the end of 1980, Air Calédonie had transported a total of 100,000 passengers in that year. In 1986, Air Calédonie's first ATR 42 landed in Magenta. It was a new-generation, 46-seater aircraft aircraft and Air Calédonie was one of the first airlines to operate it. Two more ATR 42 were purchased in 1988 and 1990 to develop inter-island services. The ATR 42 is well suited to the local aviation network and enables the company to promote tourism on the mainland and to the islands. Two Dornier 228 were added to the fleet in 1990. The Dornier is twice as fast as the Twin Otter and has the same amount of seats on board (19). It is a highly cost-efficient aircraft and, unlike the ATR, can land anywhere including on short runways like Bélep’s. The ATR 42 were replaced by two new aircraft; one was purchased in 1993 and the other in 1997. At the beginning of the 90s, the company was faced with liquidity problems following large fleet renewal investments and several social crisis. A managing board was therefore set up in July 1992. This was controlled by a supervisory board with the aim of regaining financial stability. The construction of the new Magenta airport was launched. The management and supervisory boards were created in July 1992 and dissolved in 2004. The management board's main task was to create a recovery plan which would increase the company's profit margins whilst simultaneously meeting customers' needs. In 1998, Air Calédonie invested in the extension of Magenta airport due to increasing traffic. This was finished in two phases between 2000 and 2001. The ATR 42-500 and the first ATR 72-500 arrived in Magenta in 2006. A second ATR 72-500 landed in Magenta in 2007. These three aircraft were decorated in the company's new livery: yellow and orange with bamboo-engraved totems. Samuel Hnepeune became president of Aircal's board of directors in March 2012 and was made company chief executive officer in September 2013. A vast company restructuring plan began. Aircal reached a total of 400,000 transported passengers for March 2013 to March 2014 with a load factor rate of 82%. In March, the company's 4th ATR, an ATR 72-500 landed in Magenta. This investment is worth 1.1 billion. The aircraft was financed for the most part by a loan but also with the help of the Adanc (New Caledonia Air Service Agency). The new ATR 72-500 will enable a traffic increase of almost 35% on the entire network, thus better meeting customer's needs. Since 9 December, Air Calédonie is celebrating its 60th anniversary. The company was created by Henri Martinet, Herbert Coursin, Louis Eschembrenner, Tom Johnston and Walter Hickson. The New Caledonian Territorial government became the majority shareholder during a major refinancing operation in 1969. The airline is owned by New Caledonia government (50.28%), Islands Provinces (43.31%), private investors (4.32%) and Air France (2.09%). It had 330 employees as of March 2015. Scheduled Domestic: Bélep, L'Île-des-Pins, Koné, Koumac, Lifou, Maré, Nouméa, Ouvéa, Tiga and Touho. ↑ "Renouvellement de Carte Résident." Air Calédonie. Retrieved on 8 October 2009. "Aérodrome de Magenta - BP 212 98845 Nouméa - Nouvelle Calédonie"
↑ "AIR CALÉDONIE CONTACTS." Air Calédonie. Retrieved on 2 October 2009. ↑ "Global Airline Guide 2016 (Part One)". Airliner World (October 2016): 22. Wikimedia Commons has media related to Air Calédonie.